CEEC (Comprehensive Extraction of Energy from 100 milliards (billions) ton of Coal). CEEC, Comprehensive Extraction of Thermal and Chemical Energy,is extracted from disqualified deposits of bituminous and brown coals. It produces the highest quality synthesis gas, as gaseous fuel, for combustion motors. Synthesis gas is a feedstock for production of hydrogen and liquid fuels, as well as for inexpensive chemical processing of iron ores by de-oxidation. It is a high temperature, steam carrier of thermal energy for the generation of inexpensive electrical energy, as well as: synergetic, coherent association of stream from gas and steam for highly efficient (60%) gas-steam operated turbines; self-produced inexpensive hydrogen, oxygen and nitrogen; a co-production of combustion coal along with biomasses and products for backfilling pirolytic chambers; and produces high-value CO2 on the level of 100 kg/MWh and for use of CO2 for mobilization and extraction of heavy hydrocarbons. 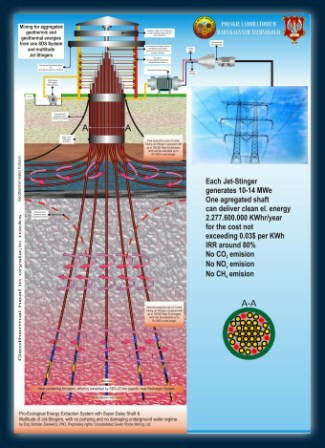 CEEG, Comprehensive Extraction of Gigantic Energy from Geothermal and Geo-Plutonic. 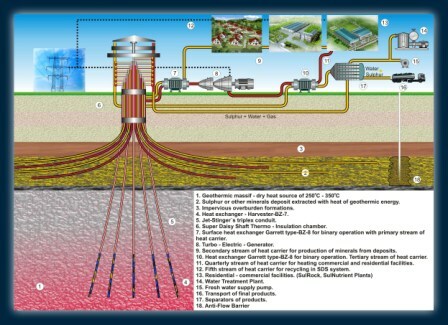 Comprehensive extraction of thermal energy for the production of inexpensive electrical energy from resources of warm Geothermal water pools through the use of the heat exchangers (BZ-6) (which means without recycling end exchanging pumped mineral water), and major extraction of dry, high temperature geo-plutonic heat, through the use of thermal heat exchangers (BZ-7). Acceleration of the pressure required for the turbine is accomplished with use of a binary system and pumping of recycled liquid with impeller-free pumps. Both energy systems cooperate with community heating systems and/or desalinization of seawaters (this is important for countries with arid zones that are close to the sea shore). Desalinization is performed based on the waste heat from the turbines. This is the newest technology for inclined or semi-horizontal deep drilling of highly efficient exchangers BZ-6 in a geothermal aquifer. This isalso newest technology for drilling production of boreholes to depths of 10,000 meters within 30 days; it offers highly efficient enhancement of heat transmission from a rocky massif to Geo-Plutonic heat exchangers BZ-7. The geothermic energy (CEES) for sulphur extraction from crystalline sulphur deposits is inheritably and coherently incorporated in the Synergy Downhole System. 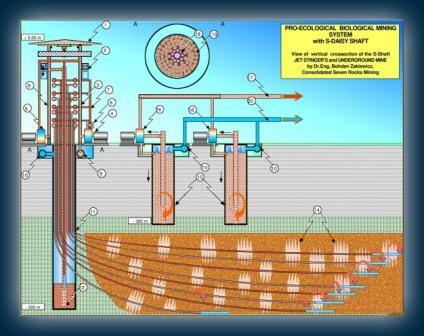 This system is operated with the proprietary Super Daisy Shaft – Bore-Hole Mining Installation, through which heat from dry, geo-plutonic geologic formations with high temperature is harvested for almost no cost. The entire plant system is self-sufficient with energy consumption by operational equipment due to electric energy generated frombypassingthe geo-plutonic stream of heat-carrying medium. This stream of heating medium passes through a heat exchanger, which supports the electric turbo generator. The CEES method does not emit any gases to the atmosphere nor wastes, which previously was a major problem insulphur mining operations. The sulphur is converted into a durable, low cost, almost universal material for the construction of roads, bridges, and chemically resistant products. It is alsoa highly valuable component of modern bio-humine-sulphur fertilizers. 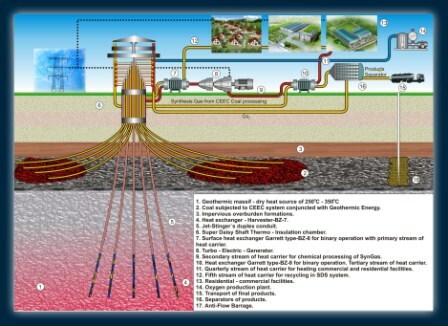 CEET – Thermofluid technology is a powerful method of mobilization, extraction, and processing of heavy crude, bituminous shale, and other minerals with use of a Super Daisy Shaft equipped with a multitude of Jet Stinger’s and utilizing geo-plutonic heat. The CEET has incorporated the most effective enhancement for recovery of hydrocarbons from difficult and non-conventional deposits. Subsequently, this method upgrades extracted heavy crude at the surface processing plant, which is considered “on-field” upgrading. This system allows for revitalization of old oil fields, re-entering them into production, often yielding higher than original quantitiy virgin production. Complex Energy Extraction produces light crude, methane, and aromatic fraction from field fractionation. Humine Acid is a component of humus soil and should be rated as a number one bio-fertilizer for every type of plantation and forestry. Comprehensive Extraction of humine acid is combined with the production of methane. It has been invented by an American laboratory and is produced on a commercial scale for golf fields and other lucrative purposes because of the high cost of the production technology. This traditional technology relies on mined lignite and brown coal. The feedstock is micronized and the reaction with microbes is performed in the surface tank reactors. CEEA technology induces the microbes into a large field developed by the system of Super Daisy Shaft equipped with a multitude of Jet Stinger’s through which microbes are delivered to the ore body. The ore body is pre-prepared with use of pyrotechnical matter and special slurry. The microbes are proliferated and breed in special vertical tanks, which are sunk into the subsurface. Utilization of a fairly small amount of the humine acid generates harvesting of rapeseed at 4-5 times the standard rate compared to traditional plantations. The world can greatly benefit from producing larger amounts of agricultural products, which yields larger amounts of inexpensive food.